Think "skirt to be worn with a tunic-length top" and you have the essence of the 1920s tunic-dress foundation slip. 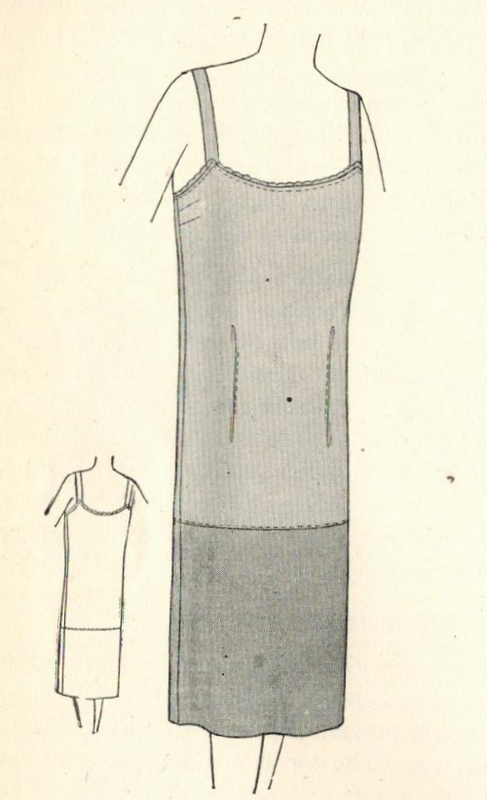 This type of foundation slip is needed for what is called a tunic dress (tunic dress example). The slip top is a modification of the camisole top, while the slip bottom is a wide band of the dress fabric deep enough to prevent the upper part of the foundation slip from showing when worn. To create a tunic-dress foundation slip, start with a plain slip pattern with a camisole top. Take in excess fullness at the hip line with darts (as at a in the image below). Use French seams under the arms and finish the neckline with lace edging. Cut the slip at the length the dress fabric is to be attached. Sew the dress fabric to slip and hem. Voila! You have a tunic-dress foundation slip. Interesting to see they use two bust darts at the side instead of the usual one. I wonder if that was just a twenties thing or if had always done that way previously? I had never given much thought to what the foundation garments were like in the '20s so yes i have enjoyed reading this series. I only recently found your blog so I am quickly catching up! I am so glad that you have enjoyed this series, jennywren! :) The double-darts at the bust is not a typical thing (at least that I have seen) in the 1920s, although perhaps more common than in other decades (I have seen it make rare appearances in later decades). I am guessing here, but I think the double-dart method may distribute the fit across the bust more gradually, rather than to a single point. It's a subtle sort of thing, I think.